Your safety is at the core of our business and is a pursuit that continues far beyond your purchase. The relationship with our customers continue far beyond the point of sale. Secure your vehicle for a memorable journey for years to come. Our commitment to passenger safety is unparalleled. Which is why we strive for the highest safety standards for every vehicle we produce. 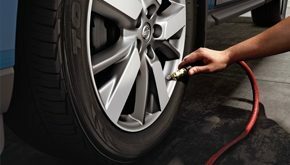 Ensure the consistent quality experience by insisting on genuine accessories with the Nissan mark of trust, for all servicing and after sales maintenance.